This is a two page death remembrance card. Krebl was a Hauptmann in the Schutzpolizei. He died on January 11, 1943 in Lebensjahr in the East. He was thirty years old. The photo has a few water marks on it, but otherwise this is a great card. You don't see a lot of officer cards. This one shows him in his visor cap with Polizei cap badge clearly visible. This is a one page death rememberance card. 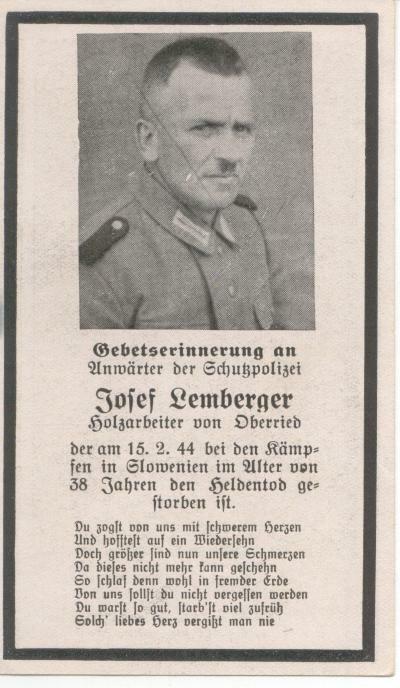 Lemberger was an Unwarter in the Schutzpolizei. He died on February 2, 1944. This is a great card. There is a slight mark across Lembergers face and a small stain on the left of the card. Neither of these things deteract from the focus of the card. 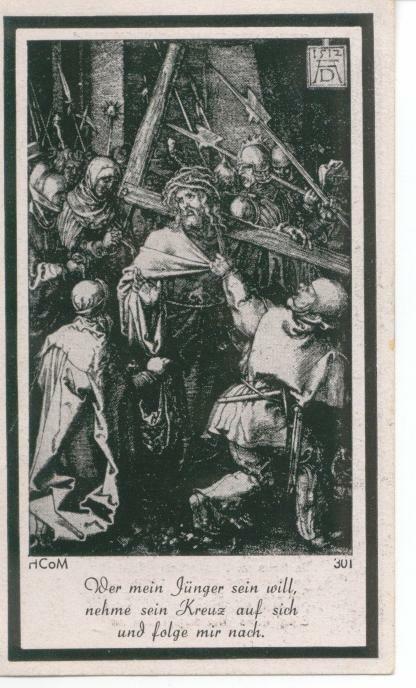 A religous scene is depicted on the reverse. 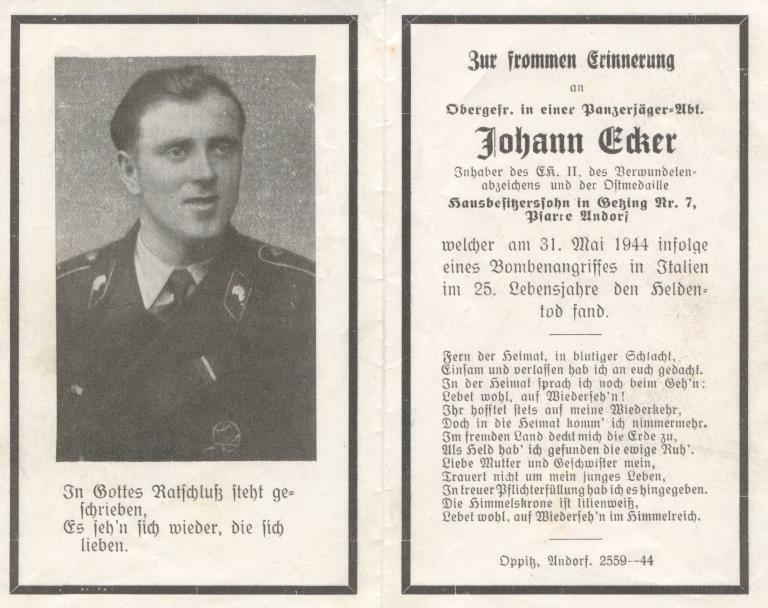 This is a two page death rememberance card for Johann Ecker. Ecker was an obergefrieter in a Panzerjager company. 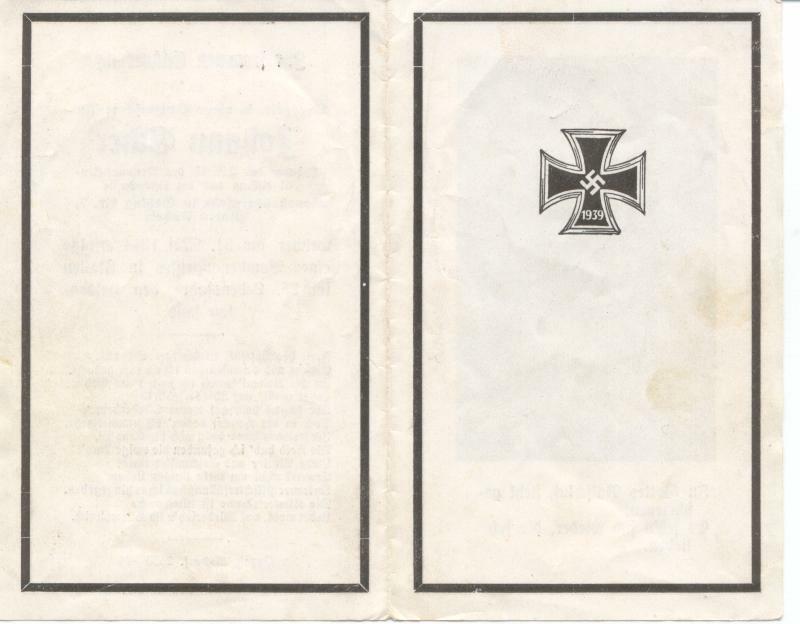 He received the Iron Cross 2nd class, the Eastern Front medal, and a wound badge. The photo of Obergefreiter Ecker shows him wearing a general assault badge, as well. He was killed as a result of a bombing on May 31, 1944 in Italy. He was 25 years old. In the photo, Ecker is wearing his black panzer tunic. The deaths head collar tabs are clearly visible in the photo. 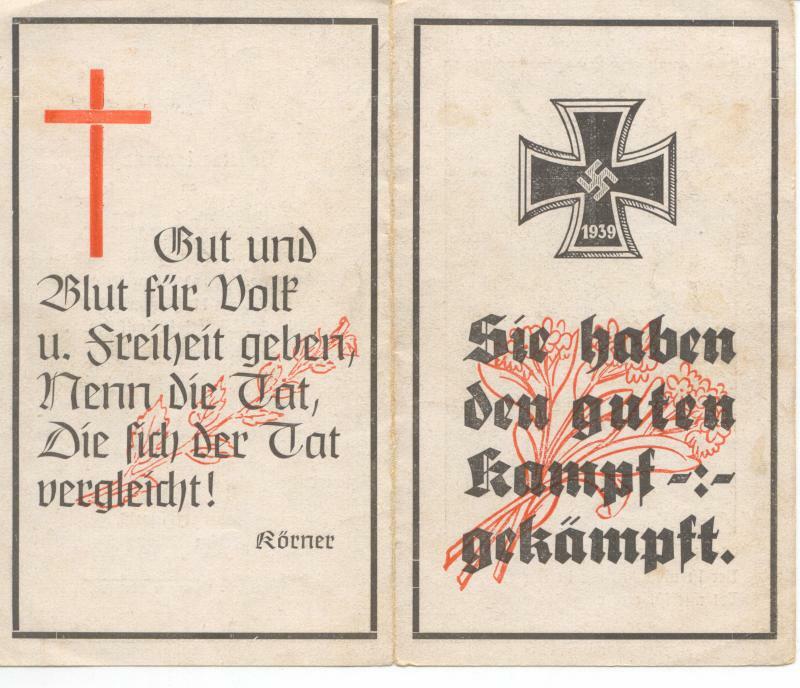 The reverse of this card is fairly plain depicting only an Iron Cross. This is a great card in great condition! U. S. Shipping- Insured Priority Mail on this item would be $6.25. First Class shipping is also available. Email me for a quote. If ordering multiple items, the total weight and value of the combined items in the package will determine the postage. 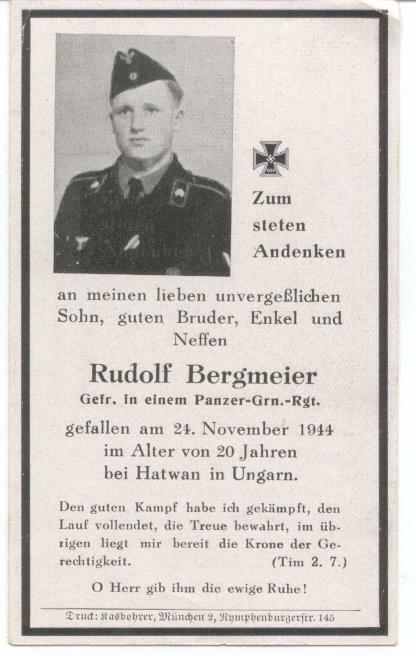 This is a one page death rememberance card for Rudolf Bergmeier. Bergmeier was a gefreiter in a Panzer Grenadier regiment. He died on November 24, 1944 in Hungary. He was 20 years old. Although no awards were listed on the card, you can see a ribbon through his tunic button hole and the top of a badge on his left breast. I can not make either out. Maybe younger eyes could. The picture on the card shows Bergmeier wearing his overseas cap and black panzer tunic. The deaths head collar tabs are visible in the photograph. 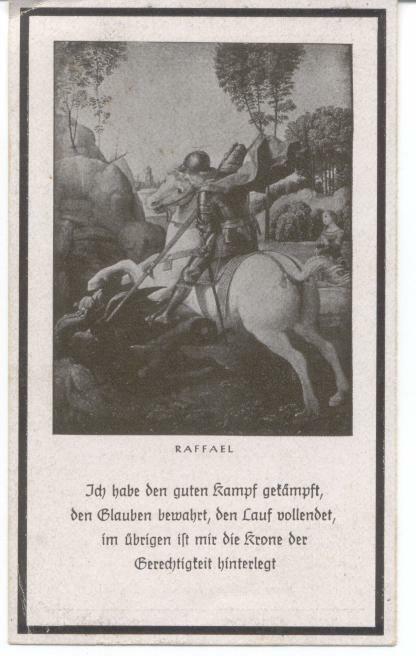 The reverse shows a knight on a horse. This is a solid card in great condition! U. S. Shipping- Insured Priority Mail on this item would be $6.25. First Class shipping is also available. Email me for a quote. If ordering multiple items, the total weight and value of the combined items in the package will determine the postage. 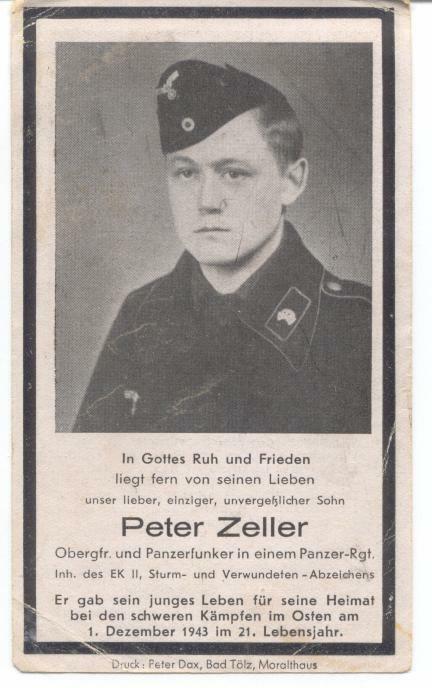 This is a one page death rememberance card for Peter Zeller. He was an Obergefreiter and a radio operator in a Panzer regiment. 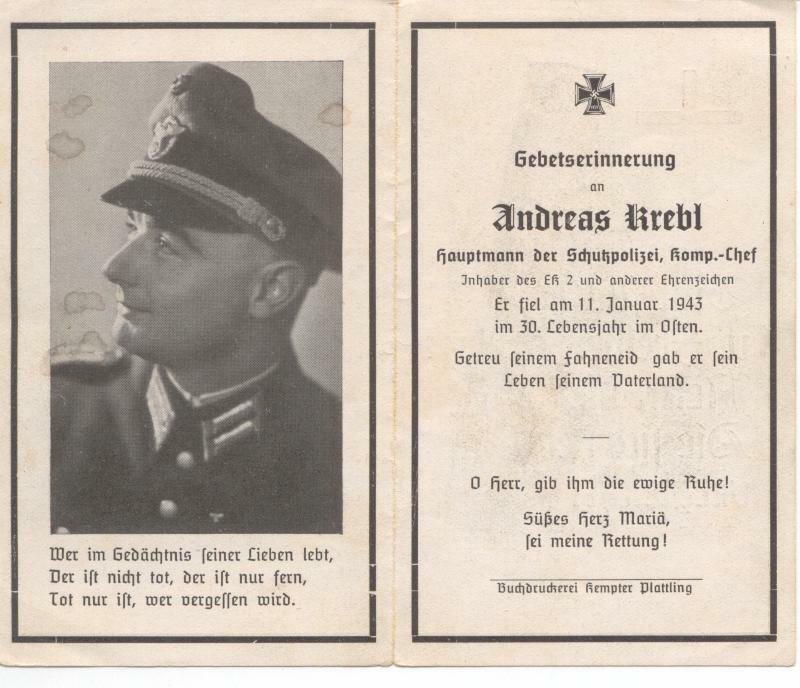 Obergefreiter Zeller was awarded the Iron Cross 2nd class, Infantry Assaut badge, and a wound badge. He was killed in heavy fighting on December 1, 1943 in the East at the age of 21. There is a large photo of Zeller on the card. He is wearing his overseas cap and black panzer tunic. One of the deaths head collar tabs is clearly visible in the photo. 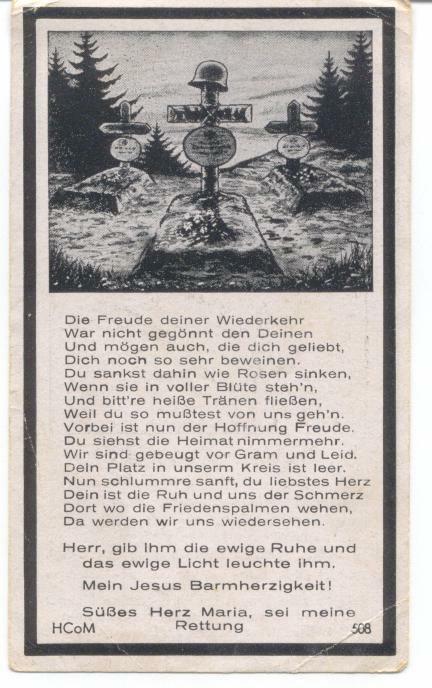 The reverse of this card shows a soldiers grave with a helmet resting upon a cross. This card does show some age. A few of the corners have slight creases. There are also a few stray marks from something on the front. Viewed directly on, they are barely visible and are not distracting. U. S. Shipping- Insured Priority Mail on this item would be $6.25. First Class shipping is also available. Email me for a quote. If ordering multiple items, the total weight and value of the combined items in the package will determine the postage.